Hey y’all! We are slowly winding down on our home management binder templates. There are just a few left and then we will put it all together for our complete home management binder. Today we will add an easy one to your current collection. Two weeks ago we discussed the basics of creating a Monthly Dinner Plan. Today’s template goes hand-in-hand with dinner planning. As you start to create your dinner selections for the upcoming weeks, make sure to jot down your needed ingredients in this basic grocery shopping list template. 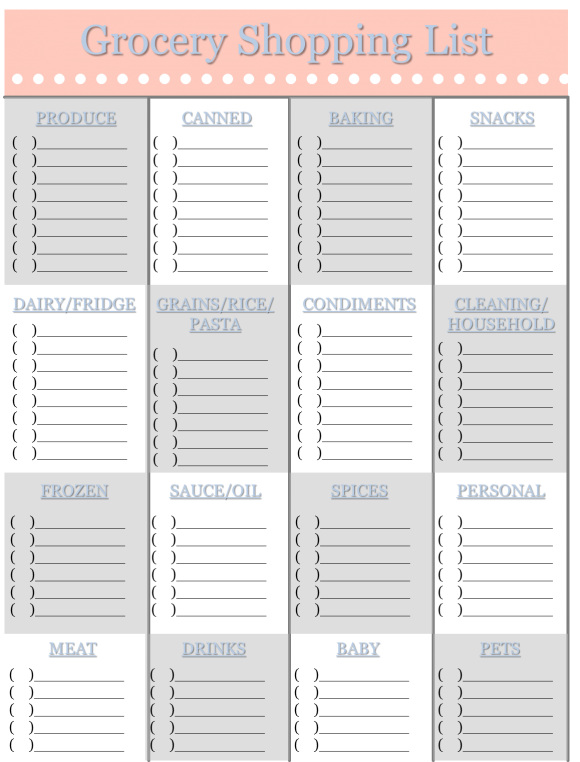 This template is a simple place to capture your family’s grocery needs for the upcoming week(s) or month. At a minimum, I would print 12 of these to have on hand. If you shop weekly, you might want to start out with a few more. You can keep a copy of this on your refrigerator or in your home management binder. Then when it is time to go to the store, put it in your purse, and throw it away when you’re done. Making a shopping list is one of the easiest ways to save money when grocery shopping. Not only does it keep you on track with your grocery needs (who put that extra box of Oreos in my shopping cart…), but it also gives you a clear picture of which coupons will be valuable for your upcoming shopping trip. When organizing your Home Management Binder, the Monthly Dinner Plan template and Shopping List template are complements of each other and are best filed together. If you plan on using coupons, this is also a convenient section to store these. Would you like to start a healthier eating regimen for your family? Check out this article from WebMD on Making a Healthy Grocery List in Minutes. As you start to get into habit of creating a monthly (or weekly) dinner plan in combination with a planned grocery shopping list, money saved should soon follow. Feel free to make as many copies of the template below as you need or use it to as a guide to make your own template.